At Makati Shangri-La yesterday, members of the media gathered to witness the launching of Dell's PowerEdge 12th Generation Servers. Being one of the bloggers who was luckily invited, I am now sharing to you the news that Dell just revealed. The following is a press release. Dell announced a portfolio of blade, rack and tower PowerEdge servers optimized for use in demanding enterprise environments. As the only one of the top five server vendors to grow server revenues in Q4 2011 with 9.7 percent year-over-year revenue growth, Dell continues to innovate to deliver features that are industry firsts and make the PowerEdge 12th generation servers the company’s highest performing, most manageable servers ever. With this new server series, customers ranging from small businesses to hyper-scale data centers can help maximize efficiency by streamlining and automating operations, help achieve better business application performance and business continuity. (L-R) Christopher Papa, Country Manager, Dell Philippines; Allan Divinagracia, Enterprise Business Manager, Dell Philippines and Christopher Syling, Business Development Manager, Intel Microelectronics Philippines Inc. The new PowerEdge R820, R720, R720xd and R620 rack servers, the M620 blade server, the T620 tower server and C6220 based on a shared Dell infrastructure server built on the Intel® Xeon® processor E5 product family are the foundation of a complete, flexible IT solution including Dell’s extensive portfolio of storage, networking and client components and professional IT services. The next-generation PowerEdge servers, along with systems management and workload solutions, are designed to deliver performance and management gains to effectively power the most demanding applications, including collaboration, IT and web infrastructure, high performance computing, decision support and business processing. Reclaim time with agent-free monitoring of over 400 sensors, including memory, RAID, storage and network devices, in multivendor operating system and hypervisor environments without installing software agents or drivers, which can save up to $2.5 million in server maintenance. Deploy servers quickly with new bare-metal deployment and provisioning that requires up to 86 percent less engineer time and up to 86 percent fewer manual steps. Help improve productivity with the enhanced Lifecycle Controller Log – significant improvements using Dell’s 11th generation embedded server management features saved Virtacore up to 43 days of system administrator time per year. Remotely enable and configure an extensive selection of network components delivered with PowerEdge 12th generation servers. Customize solutions with a new library of more than 65 scripts leveraging industry standard protocols. Dell and partners Microsoft, VMware and BMC have integrated iDRAC7 with Lifecycle Controller 2.0 with their systems management frameworks to provide mutual customers the benefits of automated one-to-many embedded management features while preserving their existing IT investments and processes. Dell also announced OpenManage Essentials, a new management console, which monitors the health of Dell servers, storage and switches. By interfacing with the Dell KACE K1000 Management Appliance, OpenManage Essentials sends user-defined server, storage and network health status alerts to the K1000 service desk. Increase performance per watt up to 101 times over Dell servers ten years ago, enabling large data centers to save up to $1.8 million per year on server power alone. An expanded Fresh Air offering for all PowerEdge 12th generation servers, based on customer feedback. Operate up to the highest excursion temperature (113° F/45°C) warrantied in mainstream servers in the industry and save up to an estimated (US) $3,000,000 in capital savings. Server fans in the R720 and T620 models that use less energy to cool the system than it takes to power a nightlight. OpenManage Power Center – leveraging Node Manager developed by Dell and Intel – controls and optimizes energy usage at the server, rack, row and room level from a single interface. The industry’s first power supply unit to be awarded the highest level of energy efficiency, the Titanium certification, based on independent testing by 80 PLUS. The ability to pack in up to 300 percent more SQL Virtual Machines per rack for higher data center utilization compared to previous generation Dell servers. The unique Select Network Adapter portfolio to protect investments with a choice of networking I/O, connection speed – including 10GbE, across the portfolio – and vendor, without using a valuable PCI slot all deeply integrated with iDRAC7 with Lifecycle controller 2.0. New all-in-one appliances built on PowerEdge 12th generation servers. Dell vStart for Dell Private Cloud, including Dell VIS Creator software, enables IT and business end users to accelerate application and IT service delivery. The Dell Quickstart Data Warehouse Appliance, which is based on the new Dell PowerEdge servers, will be the first data warehouse appliance available on Microsoft SQL Server 2012, and will help mid-market and departmental users easily organize, access and analyze data, enabling them to make more informed decisions. Improve responsiveness and provide fast customer insights, delivering up to 18 percent more Microsoft® SQL® Server transactions per second than HDD storage, with new industry leading technologies like Dell Express Flash, the first server design with front accessible, hot swappable PCIe solid state disks. Deliver up to three times the number of mailboxes with the capacity and capability for Microsoft Exchange with up to two times more message processing with Scalable Storage. Accelerate Oracle database applications with up to 86 percent reduction in transaction response time performance with Dell Compellent Data Progression Automated Tiered Storage feature. Consolidate Oracle RAC database workloads at a rate of up to 8:1, with up to 84 percent increase in power savings. Maximize security by authenticating the integrity of updates using digitally signed firmware, safeguarding access to passwords and certificates with iDRAC Credential Vault, and using Data Wipe to remove critical data from retired or repurposed servers. Ensure redundancy and maximize uptime with an array of reliability, availability, and serviceability features including hot swappable fans, disks and spare power supplies, plus unique capabilities such as Failsafe Hypervisor and Memory Page Retire. “Dell’s PowerEdge 12th generation servers take advantage of the Intel® Xeon® processor E5 family’s leadership performance and breakthrough I/O capabilities to offer optimized solutions for customers’ most important workloads. 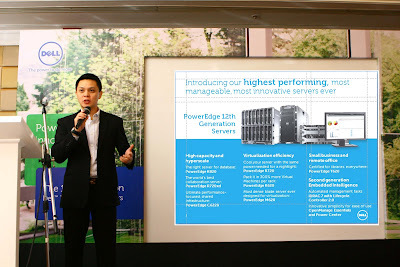 In small scale deployments, private clouds, and enterprise datacenters, customers will also benefit from key innovations such as Dell OpenManage Power Center, which is built on top of Intel’s Node Manager solution for monitoring and implementing policies for greater energy efficiency.” – Ricky Banaag, Country Manager, Intel Microelectronics Philippines, Inc.
Five new Dell PowerEdge servers are available today on www.dell.com/PowerEdge or through any of Dell’s Global PartnerDirect Channel Partners. The PowerEdge C6220 will be available later this month. Dell Inc. (NASDAQ: DELL) listens to customers and delivers innovative technology and services that give them the power to do more. For more information, visit www.dell.com. True true! I was even surprised with how much improvement Dell had in the past!! Actually, my lappy is Dell brand :) It's been 4 years since hubby bought it for me and it has never gave me a headache so far. Competition kasi is cut-throat kaya kelangan nila maging innovative. My Aunt from the states prefers Dell over MAC, while I prefer the latter (which is weird 'cause I own a Vaio, haha!). What's with the hair and the tatoo Charice?